More than 450 Mustang owners from Rocky Mountain Mustang clubs will convene in Steamboat Springs, Colorado over Father&apos;s Day Weekend. Activities will include a scenic mountain tour, auto cross, Friday night social, Show n’ Shine Car Show and awards breakfast. Spectators are welcome at the Meadows parking lot located at the corner of Mt. Werner Road and Pine Grove Road for Friday’s Autocross. Over 180 Ford Mustangs compete in this timed event. Saturday’s Show n’ Shine is a car lovers dream. 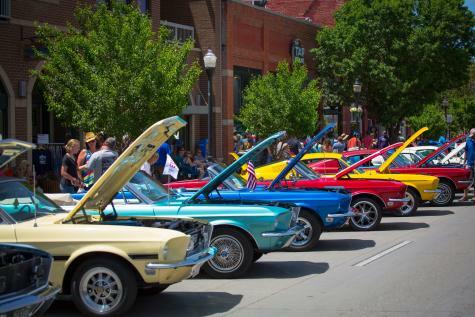 Over 450 Ford Mustangs are on display up and down Lincoln Avenue for your viewing pleasure. Both events are free and open to the public. The Roundup kicks off with a challenging tour of the beautiful countryside surrounding Steamboat Springs. This will not be a speed event. There is no cost to participate. However, sign up is necessary on the registration form found at rockymountainmustangroundup.org. Prizes will be awarded (this year will run a similar course as previous years). The Rocky Mountain Mustang Roundup and Sill-TerHar Motors are pleased to announce the first R/C car autocross event taking place from 4:00 to 6:00 p.m. on Thursday at the Steamboat Tennis Center. Hard, compound tires are requested to protect the courts’ surface. Please RSVP to sth.jeffreyc@gmail.com with participant’s age, car type and skill level. Take a thrilling run around the Meadows Parking Lot at the annual autocross event, a timed race against the clock sure to test your inner racer. Each driver will have the chance to complete three timed runs, and the event is limited to 200 drivers. Autocross trophies will be awarded Saturday at noon at the Show n&apos; Shine. Participants must bring their Autocross Confirmation and pass tech inspection before participating in the race. Chrome and clear coat shine a little brighter in the Colorado summer sun. Shine up your prized car or just take a stroll through the rows of magnificent machines at the annual Show ‘n’ Shine, which takes place from 10:30 a.m. to 3:00 p.m. on Yampa Street in downtown Steamboat Springs. A team of judges will rate the cars on engine, interior, exterior, wheels/ tires, and overall appearance, and trophies will be awarded in each category. It’s the perfect day out for the entire family to eat breakfast on a sunny downtown patio, peruse the rare cars then head for a hike right from downtown Steamboat. Interested in being a judge for the Show N&apos; Shine event? Click the link below for details on participating. Check out our full calendar at the link below for details on additional Steamboat events scheduled throughout the weekend. To learn more about the annual Mustang Roundup held in Steamboat Springs each summer or to register a car please visit the Rocky Mountain Mustang Roundup web site at rockymountainmustangroundup.org.